Science in Nursing as well as her Masters of Science in Nursing from University of Alabama in Huntsville. Melissa has spent the majority of her life in the Shoals. She and her husband, Michael, have been married for 18 years and have two children, Ethan and Taylor. Melissa enjoys spending time with her family and traveling. Melissa has over 10 years experience in cardiac care, emergency care, pain management, home health, and family practice. She has a love for the older population and wants to make an impact on the healthcare of people in the Shoals. Her primary goal is to give quality care to her patients. Melissa is compassionate and takes time to listen to her patients’ needs, remembering that their time is valuable. 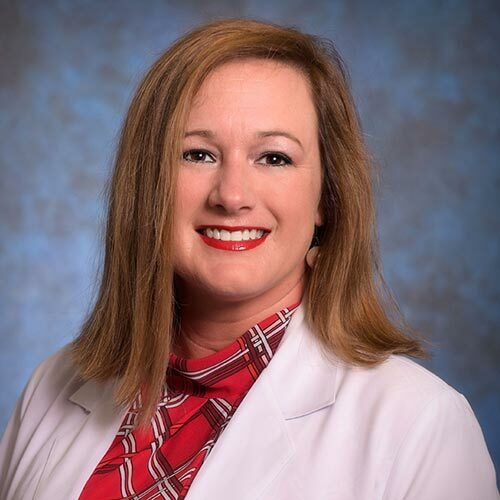 Melissa has given much to our community and the world by volunteering to speak to students about the healthcare field and going on medical mission trips. Melissa plans to continue volunteering and traveling to give great healthcare to those in less fortunate areas of the world. Are you a New Patient? Download, print and fill out our Patient Forms prior to your appointment to save time.